On the day following the attack on the 2013 Boston Marathon, a group of around 300 local runners gathered in East Cambridge and did what they do best — they ran. We ran to honor the victims and ran in defiance of the perpetrators. 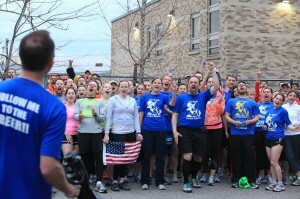 The run started with the group roaring “FREEDOM!! !” The intent was to yell so loud that the perpetrators of the attack would hear us. It was unknown at the time that the perpetrators were living less than one mile away. The 4.5 mile run around the Charles River was greeted by cars honking and pedestrians cheering. The run ended with a multi-block high-five tunnel of runners screaming in support until every runner passed. Following the run, over $4000 was collected and donated to victims of the attack. The night provided an important release to a community in shock and a way to support those who were most directly affected by the attack. The Kier Byrnes Freedom Runners would like to recreate this special night and are organizing an annual run to remember and honor the victims of the 2013 Boston Marathon attack. We are requesting donations following the run, all of which will go to victims of last year’s attack. There will be a post-run party sponsored by Courtside Restaurant featuring pizza, refreshments and karaoke. The run will start with the Freedom cheer at 7:15pm at the fountain near the Cambridgeside Galleria. The run will go by the Science Museum and then circle around the river (on the Boston side), cross the Mass Ave. bridge to the Cambridge side, and back to the Galleria fountain where you will be directed to the Courtside for the-high five tunnel. You are welcome to drop off personal belongings at the Courtside before the run, where we will have volunteers checking on them.